Here are 5 strategies builders are using to differentiate their homes and succeeding with smart home. Like any strategy, it's all about proper planning and execution. These 5 strategies should help you get started with adding smart home to your offering. From asking the right questions to selecting a proper smart home platform that works with your business needs and meets the homebuyers demand. The door lock and video doorbell are one of the first positive impressions a homebuyer sees. Smart Lock: Modern smart locks have fantastic aesthetics that can be remotely operated with a smart home app, voice, or by using a pre-programmed code. A smart lock offers convenience to the agent, but is also the first sign that this home is a smart home. Video Doorbell: Video doorbells are a fast-growing demand in a smart home. Video doorbells allow the homeowner to monitor the home when away, communicate using two-way voice, view recorded video, and more. There are many smart home platforms available that have unique capabilities, features, limitations, and installation requirements. When selecting a smart home platform, it's important to think about how the system will meet the demand of your homebuyer. 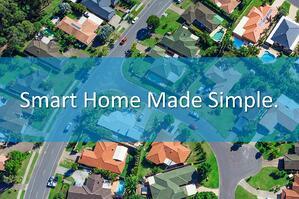 How will it help differentiate your homes? How much does it cost? Consider business questions like: How easy is it to install? How is the homeowner supported after move-in? How do I market and sell it? Keep in mind that some platforms may not be appropriate for the type of home you are selling. These systems can be complex and require certified installers for every minor change, are too costly, and can even interfere with your construction schedule. Last week, we spoke about some of these questions builders should be asking when looking to introduce smart home into their line of homes. Click here to learn more. The reality is, security is still very important to a homebuyer. A proper platform should have the capability to offer smart home, security, and even camera options. Many security systems today use wireless technology to make installation easier and cheaper for the builder. It's important to note, homebuyers don't want separate smart home and security apps. As part of the base home standard, the security system and smart home should work hand-in-hand from the same app. Stick with brands people know and you already use. Homebuyers are familiar with many of the new smart home technologies that are available today. Your base package should include devices from brands and manufacturers your homebuyers know and trust. Smart devices backed by well-known manufacturers will offer additional support to the homeowner if there is a problem with the device in the future, are usually very well documented, and offer tutorial videos and how-to's. If possible, it's important to find a smart home platform that is already compatible with devices you are already using as part of your base home package. Smart home is in high demand, but you shouldn't be forced into restructuring your business model. One of the most widely requested features in a smart home are do-it-yourself upgrade options. DIY capabilities allow the homeowner to expand their smart home system with additional items in the future. A proper smart home platform will also offer easy to install (sometimes automated over-the-air) updates that can further enhance device support for the homeowner, ensuring they can continue to grow their smart home many years down the line.